Founder of Vic's Meats, Australia's largest meat wholesaler of premium quality meats, owner of Victor Churchill butcher and the driving force behind Vic's Meat Market Day. Anthony is also the voice behind Ask the Butcher, an iPhone application designed to demystify cooking meat at home and soon– to–be a Foxtel TV show. "I have dedicated my career to promoting the people and produce that are the backbone of Australia's meat industry". Combine 1 tablespoon olive oil, 1 teaspoon ras el hanout spice and garlic. Add lamb and coat well. Heat a chargrill pan over medium-high heat and cook lamb for 3 minutes each side or until just cooked. Cover and set aside for 5 minutes to rest. Thinly slice lamb. Steam pumpkin for 10–15 minutes or until tender. Mash pumpkin and add remaining oil and ras el hanout spice. Divide dough into four 180g balls. Roll out one piece of pizza dough to form a 24cm disc and place onto a large square of baking paper. Spread base with 2 tablespoons pumpkin puree. Divide toppings evenly into four. 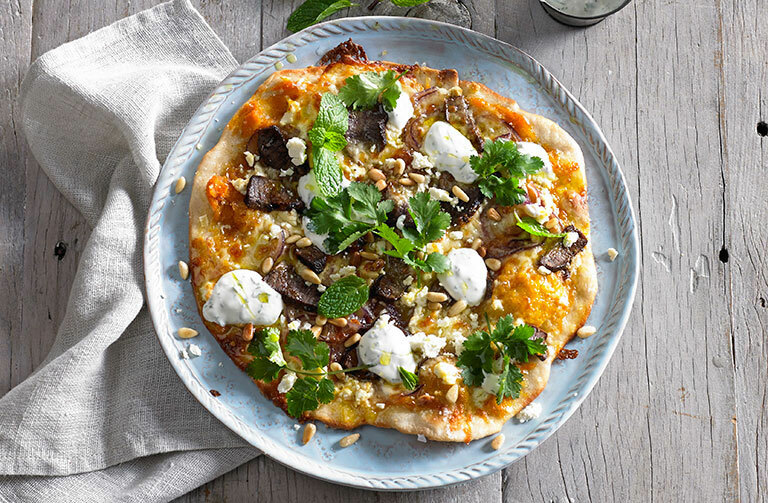 Top base with 2 tablespoons mozzarella cheese, red onion, feta, pine nuts and lamb. Sprinkle with remaining cheese and season with salt and pepper. Open lid and slide paper out carefully. Close lid and cook for 6–8 minutes or until cooked to your liking. Top with coriander and drizzle with yoghurt dressing.